Chief Theodore Orji, yesterday praised the immediate past Chief of Army Staff, Lt. Gen. Onyeabor Ihejirika (rtd), for his immense contributions and supports which he said led to the restoration of peace and security in the state. 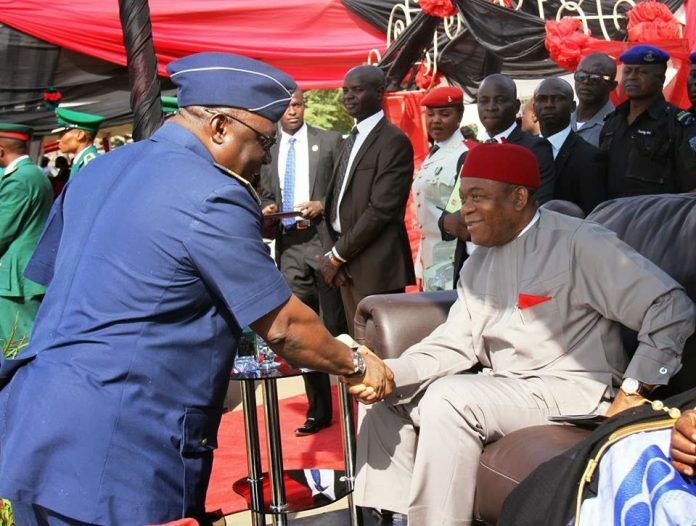 Governor Orji who disclosed this during the pull out ceremony in honour of Lt. Gen Ihejirika, held at the Parade Ground, Mogadishu Cantonment, Asokoro, Abuja, described the former Chief of Army Staff as a soldier with a difference in terms of discipline, professionalism and commitment to the Nigerian project. The governor, who thanked President Goodluck Jonathan for the appointment of Lt. Gen. Ihejirika as Chief of Army Staff in 2010, said Ihejirika’s three years and four months in office brought tremendous improvement to the Nigerian army. According to him, the former Chief of Army Staff’s support to Abia State government helped in the improvement of infrastructure being witnessed today in God’s Own State. He noted that investors now freely come to Abia to do business because of the level of peace and security achieved in the state. Earlier, in his valedictory address Lt Gen’. Azubuike Ihejirika pointed out that his appointment as Chief of Army staff came at a time the country was facing daunting security challenges ranging from kidnapping in Abia State to terrorism at the national level. He enumerated some of his achievements to include training of the Army, establishment of military outposts in some areas of the country as well as curbing the menace of terrorism in Northern part of the country. The former Chief of Army Staff also called on the Nigeria Army to remain cohesive and loyal to Nigeria constitution as well as President Goodluck Jonathan as doing so will aid in maintaining peace and order in the nation. He thanked President Jonathan for giving him the opportunity to serve and appreciated Vice President Nemadi Sambo, Governor T. A. Orji, Senate President, Senator David Mark, Speaker of House of Representatives, Hon. Aminu Waziri Tambuwal, past leaders, men and officers of the army for their supports throughout his tenure. The well-attended event featured inspection of Guard of honour by Lt. Gen. Ihejirika and parade match past by men and officers of the army. Dignitaries that graced the pull out ceremony include Minister of Information and Supervising Minister of Defence, Mr. Labaran Maku, Chief of Army Staff , AM Gen KTJ Minimah, Chief of Air staff Air Vice Marshal, Adesola Amosu, Chief of Naval Staff, Rear Admiral Usman Jibril Senator Uche Chukwumerije, Hon. Nkeiruka Onyejeocha, Hon. Mao Ohuabunwa, Engr. Chinedum Orji among others.